Image caption Are you guilty of poor cyber-security habits? When you ring IT support, you know the geek on the other end of the line thinks you’re an idiot. It’s the heavy sigh and patronising tone that give it away. In fact, they have an acronym for us – PEBKAC. It stands for Problem Exists Between Keyboard And Chair. That’s you and me. And before you get on your high horse full of indignation, ask yourself: when did I last back up my data? 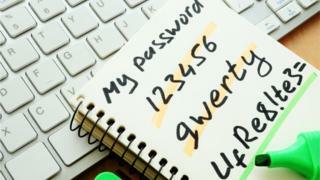 How many online accounts do I use the same password for? How many times have I clicked on a link in an email without really knowing who sent it? 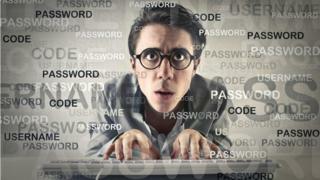 Every year we’re reminded how dumb we are when it comes to choosing passwords. These range from the obviously bad “123456” and “password”, to the only marginally improved “12345678” and “admin”. Other popular ones, according to a list drawn up from those found in breaches, are “letmein”, “iloveyou”, “welcome” and “monkey”. Image caption Admit it, you’ve often written down your password in a place anyone could see it, haven’t you? With passwords like these, a child of two could probably break in to your account after bashing on the keyboard with a toy hammer for a few hours. The fact is we’re lazy. “A lot of people forget their password and then just use the temporary password the IT department gave them,” says Thomas Pedersen from OneLogin, an identity and access management company. So in a large organisation, there are potentially hundreds of people using the same password. “This makes them vulnerable to a password scrape attack – taking the most common passwords and trying them on millions of accounts,” says Mr Pedersen. Once inside the system, the hackers can cause havoc. 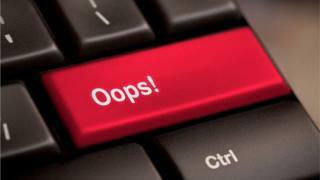 Major data breaches are becoming almost weekly occurrences, with Facebook, Cathay Pacific, British Airways, Reddit, Wonga, and Dixons Carphone joining a long list of corporate victims in recent months. Two-factor authentication – using your smartphone or a separate dongle to provide an extra layer of security on top of your main log-in details – is becoming more common, especially using biometrics such as voice, fingerprint, and facial recognition. But these are less suited to the corporate environment because desktops don’t usually come with fingerprint readers or video cameras built in, Mr Pedersen points out. We’re also pretty dumb when it comes to clicking on links and downloading content we shouldn’t, says Ian Pratt, co-founder of cyber-security firm Bromium. A lot of these links are loaded with malware – programs designed to burrow though corporate security systems, steal data or even take remote control of machines. “More than 70% of the breaches that we hear about have started on a PC with some hapless user clicking on something that lets attackers get on to the network,” says Mr Pratt. And hard-pressed IT departments have had their lives made even more difficult in recent years by the surge in mobile phones, laptops and tablets we use for work as well as for private purposes. So, many large firms are focusing on making the desktop PC idiot-proof. Bromium’s tech works by isolating each and every action that takes place on a PC – sandboxing to use the jargon. This means that if you click on a malicious link, the malware is isolated and can’t escape to infect the rest of the network. Image caption Would face recognition and other biometrics improve security in the workplace? But keeping an eye on what we’re doing across a sprawling IT network is very hard, says Paul Farrington, a former chief technology officer for Barclays and now a consultant at security firm Veracode. Large organisations being clueless about the extent and reach of their IT assets is “very common”, he says. A project Veracode carried out for one high street bank discovered 1,800 websites the organisation had not logged. “Their perimeter can be 50% larger than they originally thought it was,” says Mr Farrington. And this ignorance can also extend to the number of computers – or “endpoints”, in the jargon – sitting on a corporate network, says Nathan Dornbrook, founder and head of security firm ECS. One of his clients has more than 400,000 machines to manage, and several other customers have similar numbers. “The machines could contain substantial amounts of information and customer data, passwords to internal systems, and all sorts of bits and pieces in the easy single sign-on applications that cache credentials locally,” he says. In other words, just one of these PCs could be an Aladdin’s cave to a hacker. What’s the point of concept cars? So given that we’re PEBKACs and IT departments are overloaded, automated systems are becoming increasingly necessary, cyber-security experts say. For example, ECS uses the Tachyon tool from security firm 1E to help monitor millions of PCs and keep them updated with the latest software patches and security updates. “Otherwise you just don’t have time to react,” says Mr Dornbrook. Many other cyber-security companies are moving from a firewall approach to automated real-time traffic monitoring, looking for strange behaviour on the network. But it would certainly help if we all didn’t behave like PEBKACs at work and casually give away the keys to the kingdom. 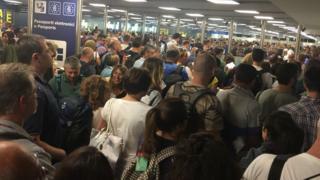 New technologies are helping to tackle one of the great scourges of air travel – airport queues. But at what cost to our privacy? Queues to check-in and drop your bags, at security, at passport control and finally queues at your boarding gate. Air travel can be a frustrating business, even if these queues are largely a result of airports trying to ensure our safety. And as more of us fly – 4.4 billion passengers are forecast to take to the skies in 2018 – airports are being pushed to their limits. So the industry is hoping technology can streamline the process, with increasing use of biometrics such as facial recognition – and not just at passport control. For example, British Airways uses facial recognition when boarding passengers on domestic UK flights, as well as for some international flights out of the US. 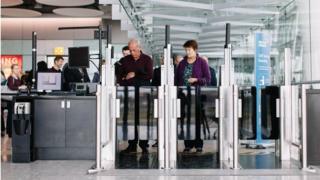 Travellers flying from Heathrow are photographed when going through security. 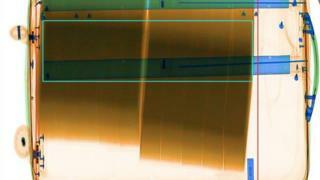 A second photo is taken at the boarding gate – and if the image matches the original one and the data confirms they are at the right gate, it automatically opens. The US system combines check-in information with biometrics – images and fingerprints – and biographical data from passports and visas. When a passenger arrives at a boarding gate, a new photo is taken and compared to the data on record. Raoul Cooper, digital airport design manager at British Airways, says this approach can halve the time it takes to board 240 people onto an international flight, with a consequent 10% improvement in flight punctuality. “We believe that this starts to prove how we can use identity services more widely and is an important part of our ambition to create a seamless journey,” says Mr Cooper. 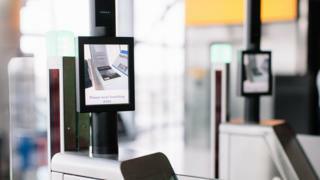 Similar face-scanning technology is being trialled at Singapore’s Changi airport, where one potential application could be spotting lost passengers who’ve missing the final boarding call for their flight, the airport operator says. Changi’s Terminal 4 is already using the tech for self-service check-in, bag drop, immigration and boarding. In the US, Delta Airlines is planning to use facial recognition at check-in, security, boarding and customs at the Maynard H. Jackson International Terminal at Jackson Atlanta airport, doing away with passport checks altogether for some international travellers. 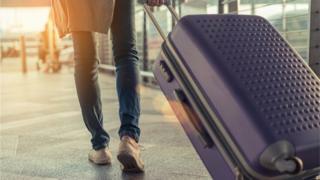 Research consultancy Frost & Sullivan reckons airport spending towards improving the passenger experience will reach $4.2bn (£3.2bn) by 2020. “Technology integration into airport functions is driven by a growth demand in air travel and shrinking terminal capacity,” says Renjit Benjamin, the firm’s industry analyst for aerospace, defence and security. 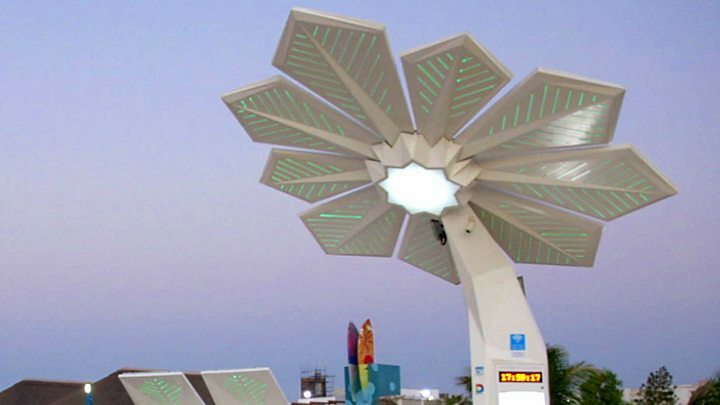 Dubai airport in the United Arab Emirates also has big – and quirky – plans for biometric technology. The airport intends to replace traditional security desks with aquarium-like tunnels featuring up to 80 face-scanning cameras disguised as fish. As passengers walk through they are scanned from every angle while they look at the images, and the captured data is compared with existing ID photos. The first tunnels are due to be installed by the end of 2018, with all terminals to be equipped with the tech-aquariums by 2020. Tech start-up VChain believes blockchain, the technology underpinning cryptocurrencies, will help provide us with secure, verifiable digital identities that could make airport queues a thing of the past. Its software generates a signal – a mathematical version of the red, orange, green of a traffic light – about a passenger’s passport, helping authorities verify the passenger’s identity and build a “reputation” and trust score around that travel document. These mathematical signals are stored on the blockchain, preventing tampering and achieving verifiable consensus. The more times the passport and passenger data is verified, the better its reputation becomes, such that inaccurate data entered on a booking website – a common occurrence that contributes to delays – could be corrected automatically, the company hopes. “[Blockchain is] the best approach we have developed to date as a civilisation for record keeping,” claims VChain’s chief executive Irra Ariella Khi. Can the city of pizza reinvent itself as a tech capital? The VChain platform is being tested by IAG – the global airline group that owns BA, Iberia, Aer Lingus and Vueling. “The airport of the future will see passengers breezing through without annoying queues or document checks, with their passport never leaving their pocket,” she says. But wherever biometrics is deployed, concerns about privacy and data protection are sure to follow. 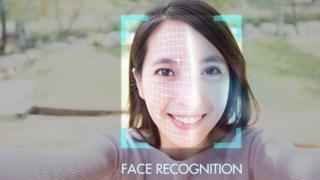 Image recognition is getting better, but it is far from infallible, with human rights campaigners such as Privacy International and Human Rights Watch warning about misidentifications and the potential for abuse by authorities. For its part, BA says it does not hold any passenger ID data, but transfers it to the US Customs and Border Protection identity system, which then sends back anonymised “match” or “no match” signals. And as long as air passengers benefit from the increased convenience of queue-less air travel, privacy concerns may remain muted. 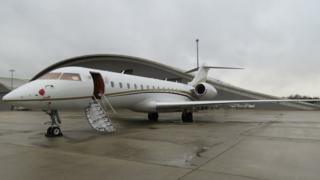 Four men have been convicted of smuggling half a tonne of cocaine with a street value of more than £41m into the UK on a private jet. Fifteen suitcases of the drug were found at Farnborough Airport in January on a plane returning from Colombia. Allessandro Iembo, Martin Neil and Victor Franco-Lorenzo were jailed for 24 years each while Jose Ramon Miguelez-Botas was jailed for 20 years. Border Force officers said the haul was one of the largest they had dealt with. 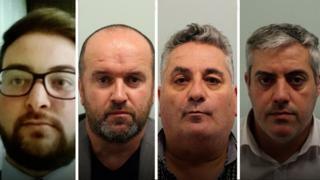 Italian national Iembo, 28, Neil, 49, and Spanish national Franco-Lorenzo, 40, all from Bournemouth, and Miguelez-Botas, 56, from Spain, were found guilty of fraudulent evasion of a prohibition in relation to a class A controlled drug, between 30 October last year and 30 January. Neil’s brother, Stephen, who was also on trial, was found not guilty of the charge. The court heard the four convicted men – along with Stephen Neil, who had been described by lawyers as “naive” – travelled together to Bogota, Colombia, in a jet from Luton Airport on 26 January at a cost of £138,500. They arrived at Farnborough Airport three days later with 15 suitcases of cocaine on board. They were met by a fleet of cars hired to carry their baggage but were stopped by Border Force officers. The National Crime Agency (NCA) said no attempt had been made to disguise the haul, which weighed 500kg and were labelled with a “Superman” logo, thought to be linked to a major Colombian cartel. In the investigation that followed, it emerged three of the men – Iembo, Franco-Lorenzo and Martin Neil – had made a previous undetected trip in December 2017. A woman had called a private jet broker saying she represented a group of rich men who worked in the music industry and were involved in cryptocurrencies. She said they were travelling to Colombia to see singer Bruno Mars perform and wanted to hire a plane from Luton Airport and would pay £128,500 in cash. X-ray pictures of their baggage, retrieved later, appeared to show millions of pounds in banknotes used to pay for the drugs. Iembo told jurors he had made trips as a personal assistant for a charity and had assumed the suitcases, which were loaded on to the plane before the trip, contained charity documents. When the plane returned, suitcases were taken to an address in Bromley. Investigators found the gang had a corrupt official working for a ground handling company at Bogota Airport who ensured the drugs were loaded on to the plane. A parallel investigation in Colombia led to five arrests. Police discovered criminals in Bogota had used armoured vehicles and a bogus police officer with a fake sniffer dog to “inspect” the luggage before it was taken on to the plane. Martin Neil celebrated as his older bother was cleared on Thursday. 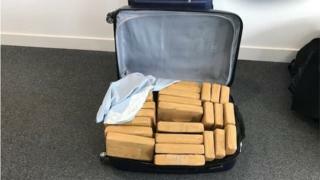 Judge Philip Shorrock said the “serious and commercial operation” nearly succeeded in bringing an “enormous haul” of cocaine into the UK. He said, while the four did not mastermind the operation, they played a “crucial part” in the hope of walking away with a “substantial” amount of money. NCA senior manager Steve McIntyre called the January seizure “an audacious smuggling attempt” which highlighted “a border vulnerability”. He said: “There are over 3,000 airports or airstrips in the UK and there’s no way on this earth that any law enforcement agency is going to be able to man those all the time. Mr McIntyre said, despite being bricklayers, the Neil brothers and their co-defendants “lived an interesting lifestyle of lavish motor vehicles to get them to the aircraft”. In 2016, the Independent Chief Inspector of Borders and Immigration raised concerns that customs checks at smaller airports were not rigorous enough, including at Farnborough. The Farnborough seizure, she said, demonstrated Border Force officers could pick out passengers and bags which looked suspicious for further checks. She added the haul had been “an amazing morale boost”. “This is one of the largest seizures in our region’s history and it’s a day we want to celebrate,” she said.